You know how much I love chocolate but I have to say banana muffins/banana breads are so good just plain. I found myself thinking this recipe might actually work better with a slightly smaller ratio of chocolate batter to plain. I'm not complaining though! As I mentioned, I baked the muffins in regular-size muffin tins instead of jumbo. You place the plain batter into the bottom of the muffin cups, then try to make a trench for the chocolate batter to go into and on top of the plain. Well, I found it impossible to make the trench so I spooned the chocolate batter into the plain, pushing the spoon down a bit. Perhaps there'd be some more wiggle room if using large/jumbo-size muffin tins to bake these in but in my case, it was hard to swirl the batter. i did my best and in retrospect, it would probably have been better to place alternating dollops of each batter (like this) and then giving it a swirl. It'll taste very good either way. We're talking moist banana muffins, flavored with not only the bananas and dark chocolate but also cinnamon and nutmeg. 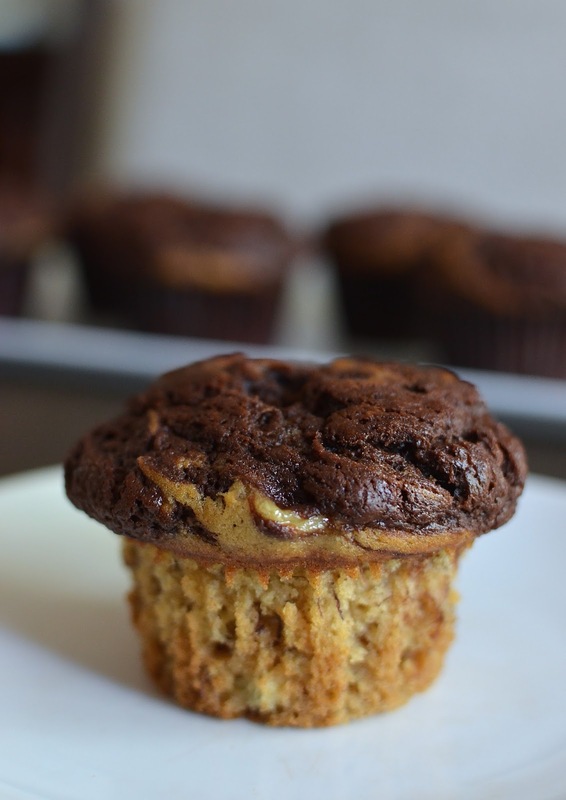 Basically, if you like banana muffins, you really can't go wrong with making a batch of these. Well, the freezer is stacked with waffles, I'm stowing away pancakes, and I have a feeling I'll be making muffins on a fairly regular basis. I don't need much incentive to bake muffins anyway - I think it's one of the simplest, most relaxing yet rewarding, things to bake. And we're adjusting to our new middle school schedule pretty well so far. The day starts a little earlier and I'm switching up my routine when it comes to everything from meals to exercising and running errands. All in, I like it so far, which just goes to show that change is not only inevitable but often for the better! Preheat oven to 350 degrees. Line the 12 cups of a regular-size muffin tin with paper liners. Melt chocolate chips with espresso in a heatproof bowl set over a pot of just simmering water. Remove from heat and let cool. In a large bowl, whisk the flour, sugar, baking soda, salt, cinnamon, and nutmeg together. Make a well in the center of the mixture. In another bowl, mix together the mashed bananas, eggs, oil, buttermilk, molasses, and vanilla. Add mixture into the dry ingredients, stirring until just combined. To make the chocolate batter, transfer about 1 1/2 cups (330g) of the prepared batter into a separate bowl, and stir in the melted chocolate to combine. Bake until a cake tester inserted into the muffins comes out clean, about 25-30 minutes. Let cool in the pan for a few minutes, then transfer to a wire rack to cool. Thanks so much, Cheri. I really appreciate it. Hope your son is enjoying middle school so far. 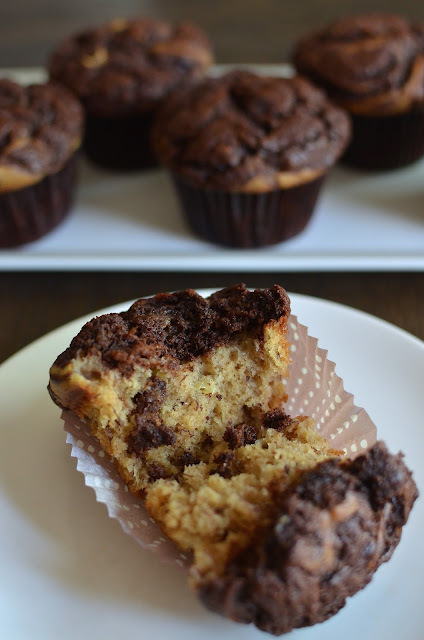 These muffins would definitely help make the earlier mornings much easier. Banana and chocolate is such an awesome combo and I love the pretty swirl! Chocolate and bananas...YUM! Don't you think it is silly that the schools do this.. The youngest kids that are up before the 0500 alarm and ready to go don't start school until later and the older kids that seriously need their beauty sleep are the first to start. Thank goodness you have muffins to jumpstart the day. These look delicious and so pretty. And I agree they are so convenient and a good way to start the day! I love being a morning person and following a routine. I feel it allows more time instead of rushing. Wow, I'd enjoy one of those for breakfast, snack, lunch AND dinner! haha - thanks. Banana muffins never fail. 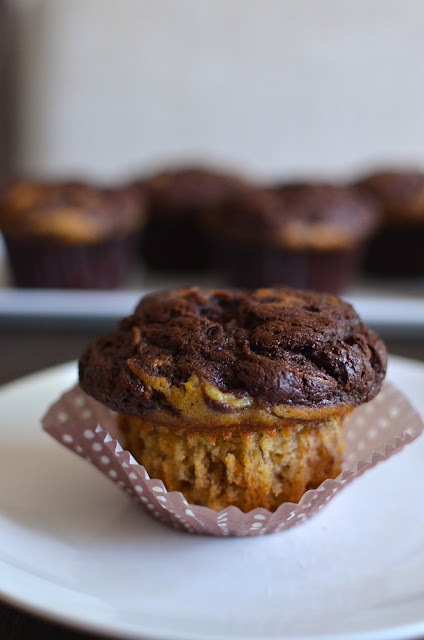 These gorgeous muffins are great to kick start the morning!! They are a nice treat on some mornings. Oh boy these will get you up in the morning for sure! I love that they are a breakfast muffin but probably taste like dessert. The texture looks wonderful and the combination of flavors equally so! I am a morning person but with the cooler morning temperatures, I seem to want to stay in bed. Have a lovely week Monica! Oh, you know how fragrant and sweet banana muffins are. Definitely our favorite. And it's definitely turning chilly and I don't mind getting up a tad bit later either. ; ) Thanks, Tricia. Banana and chocolates make a great pair. I love using them together in my recipes, so I can tell they will be a hit at my place. Awesome way to start a morning. One of my favorite combo. Looks so delicious. I can have this anytime of the day! Mmmm I love banana and chocolate together! What perfect muffins! These are exactly what I need for breakfast! I have been thinking about muffins for a few days, but wasn't sure which kind. Banana and chocolate would be PERFECT! Muffins are so easy to make and easy to love. Thanks, friend!